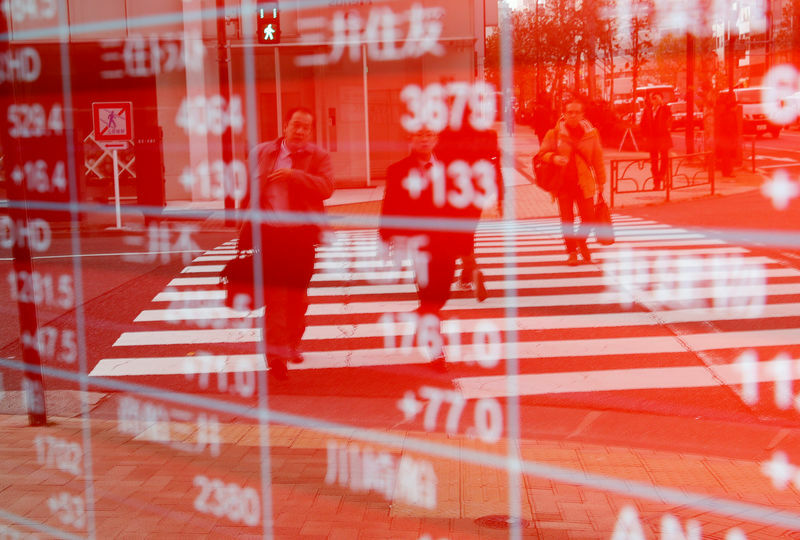 SHANGHAI (Reuters) – Asian shares weakened on Friday as trepidation ahead of the start of the U.S. corporate earnings season and underlying anxiety over the global growth outlook eclipsed some reassuring U.S. economic data. Shares in Europe are expected to open fractionally higher, with pan-region up 0.03 percent at 3,366 in early European trades. German were 0.02 percent lower at 11,971.5 and futures were up 0.2 percent at 7,377. MSCI’s broadest index of Asia-Pacific shares outside Japan was down 0.1 percent, having earlier see-sawed within a tight range. Despite broad weakness in the region, with Chinese blue-chips down 0.4 percent ahead of the release of March trade data, higher Chinese iron ore prices helped to push Australia’s up 0.85 percent. Japan’s stock index gained 0.7 percent. Michael McCarthy, chief market strategist at CMC Markets and Stockbroking in Sydney, said markets were in a “holding pattern” as they awaited Chinese trade data and the U.S. earnings season. Matt Simpson, senior market analyst at GAIN Capital in Singapore, said a dovish shift by central banks, together with possible progress on a U.S.-China trade deal and U.S. President Donald Trump’s talking up of the markets could help to support equities in the coming weeks. “Consumer discretionary and information technology are more than outperforming the rebound, and that generally is what you see in the start of an upswing, not near the end of a cycle,” he said. The tepid performance of Asian markets Friday followed a choppy session on Wall Street that left major indexes treading water, hemmed in by anxiety ahead of corporate earnings and worries about a global economic slowdown, which capped gains stemming from upbeat U.S. economic data. The fell 0.05 percent to 26,143.05, the S&P 500 closed flat at 2,888.32 and the dropped 0.21 percent to 7,947.36. Comments from Federal Reserve Vice Chairman Richard Clarida that the U.S. economy is in a “good place” but re-emphasising the Fed’s patience on rate hikes, also helped to reassure investors. “One of the big takeaways from the past few days has been the broad decline in volatility across markets,” National Australia Bank (NAB) analysts said in a morning note. NAB attributed the muted reaction to recent events to dovish policy shifts by central banks, signs that China’s stimulus measures are having an effect, continued U.S.-China trade talks and the Brexit delay. Christine Lagarde, International Monetary Fund managing director, said on Thursday that the six-month delay of Britain’s exit from the European Union avoids the “terrible outcome” of a “no-deal” Brexit, but does nothing to lift uncertainty over the final outcome. Underscoring threats to the global economy, IMF Deputy Managing Director Mitsuhiro Furusawa warned that a bigger-than-expected slowdown in China’s economy remains a key risk. On Friday, the yield on benchmark fell to 2.4969 percent compared with its U.S. close of 2.504 percent on Thursday. In currency markets, the dollar was up 0.13 percent against the yen at 111.79, but a strong gain in the euro, which jumped 0.32 percent on the day to buy $1.1286, pushed the down 0.17 percent to 97.011. Traders said demand for the euro jumped on speculation of increased demand for it from a Japanese bank’s plans to buy a multi-billion dollar aviation finance business from a German bank. ticked up 0.42 percent at $63.85 a barrel, while was up 0.37 percent at $71.09 per barrel.